The first half literally turned my brain to mush. Other than Musacchio and Locatelli getting yellow cards, the most notable event was Locatelli lecturing Montolivo after the elderly player headed the ball out of bounds. Well that, and Bonucci was our best attacker. The second half was slightly better in the same way that stepping in gum with your old shoes is better than stepping in gum with your new shoes. The closest shot of the game was when Montolivo hit the post in the 59th. Even the cameramen lost their stomachs for the game and decided to instead juxtapose clips of Jimenez and Montella and their antics. The cameramen were smart, that was so very much more entertaining. But watching a snail move two inches would have also been more entertaining. Yes, it really was that bad. The quilted jacket is new, now why not some new tactics? 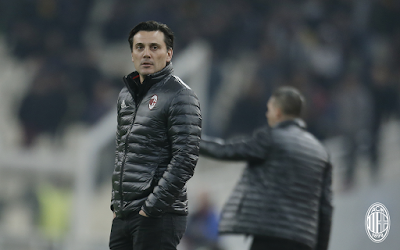 Montella lined up a 3-4-1-2, but not the right players to make it work. For example, anytime you see both Montolivo and Borini in a starting lineup, that is not a recipe for success. But all stereotyping aside, the man admitted he doesn’t know which trousers go with which socks. But clearly the man doesn’t even know how to get dressed. We saw how AEK nullified everything we had two weeks ago, and Montella did nothing to try to change that. His tactics have become a giant black hole. Results are what make or break a coach’s job. And while no one could have realistically predicted we would win this one, a draw isn’t much better than a loss in our current downward spiral. But if you go by performances, this performance was worse than a loss. Certainly, as a fan, I am grieving for my football sensibilities after having watched it. And as we head to Sassuolo on Sunday, it truly feels as if Montella is pulling us closer and closer to an endless black hole.